Someone should dox her. Another example of the unhinged left threatening those who disagree with them. 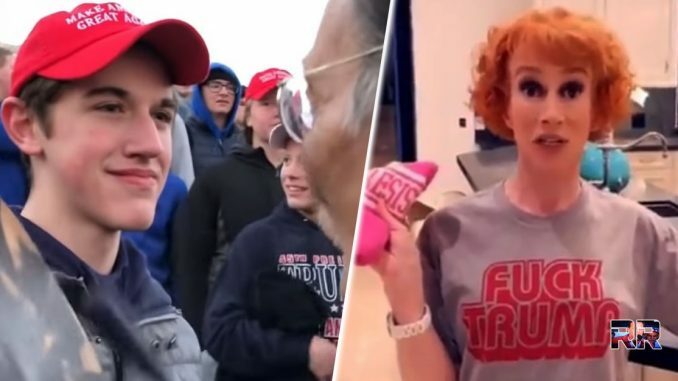 “Comedian and far-left activist Kathy Griffin called for doxxing and publicly shaming the high school students at Friday’s March for Life who were accused of mocking a Native American man. I watched the video about 10 minutes on both sides. The worst the kids did was wear a MAGA hat….which I hate. But that is it. Let’s just charge all teens as adults! Also, this is out of context. The kids were confronted and his personal space invaded. At first, they were laughing and dancing. They were told to go back to Europe. It wasn’t until then that they realized what was happening and got slick. I wanted to punch that kid at first until I saw the full video. Guy walks through the full crowd and stops at him to beat a drum in a his face, smiling was probably the best thing he could have done at that moment. Kathy Griffin has proven that she is a menace to society and is seeking to cause harm to individuals, especially since she held a mock decapitated head of President Trump in 2017. Now she’s trying to dox young kids which could lead to them being violently attacked. She should be arrested & investigated. Share this if you think Kathy Griffin should be arrested for this!